On the night of April 20th, 150 people waited patiently to hear acclaimed author and translator Lydia Davis talk about her latest translation of Madame Bovary. The event organized by the Center for the Art of Translation took place at the Verdi Club, where attendees were sipping wine in anticipation. When Davis went on stage, she told the crowd that she was happy to be among people interested in translation. Her hour-long reading, punctuated with silences and a sense of humor, captivated the audience, bringing back glamour and excitement to the translation profession. Davis started by giving a brief description of the plot, concluding that Madame Bovary is a story of feminine disillusionment. She said that she liked the book but didn’t love it as much as Bouvard et Pécuchet. She did, however, love “many moments in the book, things Flaubert was doing with it,” admiring along the way “Flaubert’s genius at condensing years into a few pages.” When, with the bluntness of a writer, she added “misguided and cruel women are not of my taste,” the public exploded laughing. The translation took her three years. After she made the first draft she consulted 11 previous translations. There are supposedly 20 translations in existence. At the end, she chose five translations to work with closely, but when a problem arose, she looked at all of them. She told the audience that sometimes she lifted from them—beginnings of sentences and words, only because “previous translators lifted from each other.” (The comment suscitated some good laughs in the room.) She was surprised to find out that most of the translations were not close to the original text. And from experience she added “When a book is well written, as is Madame Bovary, and the translation stays pretty close, it will come out pretty well.” She is already in the process of revising the hardcover for the paperback edition. Davis is fond of Gerard Hopkins’ British translation of Madame Bovary, “Although,” she said, “he generously added to the text.” She illustrated her point with a passage where Hopkins added a completely new sentence to the end of a paragraph. She went a few times to the NY Public Library to consult a translation annotated by Nabokov. She abandoned the project, not only because she lives far away, but also because she saw notes she didn’t agree with. After much hesitation, Davis left untranslated Emma’s fichu, not replacing it with a scarf, which she thought would not produce the same effect. Concerning Charles, whose name she pronounced in English throughout the reading, in the phrase, “Il mastiquait un goût de truffes”—she thought of translating mastiquer to savor, but chose chew instead to stay close to the French. He (Charles) chewed a taste of truffles. Callosité became callousness after hardiness was voted out. 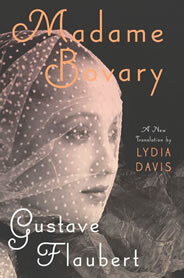 For Davis, Madame Bovary was a project she always wanted to do. “I am not sorry for it,” she said. But she is ready to go back to writing. In the future, she may finish the translation of the 3rd volume of La Règle du jeu by Michel Leiris, which she started a while ago, but she has no other translation plans. Nina posted this article under Announcements	on Thursday, September 1st, 2011 at 12:07 pm	You can follow any responses to this entry through the RSS 2.0 feed. Both comments and pings are currently closed.